Occasionally, if you keep your eyes peeled, you can find great products in the grocery store. I discovered SenSpa at my local Waitrose and it's becoming a new favorite of mine! 97% natural and 100% lovely, these products are starting to multiply in my bathroom as I pick up more and more of them to try during my weekly grocery shopping trip. I'm constantly on the hunt for great shower gels that I can pick up locally. While I love a good luxury shower gel find, it's not always a top priority or something I can grab at a moment's notice in my neighborhood when I run out of whatever I've been using. I recently found myself completely without shower gel on a Sunday afternoon, so I picked up these products and they're fantastic! Clear the Mind Body Wash contains essential oils of peppermint and camphor, making it the perfect shower product for waking up in the morning or for soothing sore muscles after a tough gym session. The mint and camphor is cooling, refreshing and reviving. SenSpa Clear the Mind Body Wash also contains Thai basil which is an antioxidant and Aloe Vera for hydration and soothing. SenSpa Detox Body Scrub and the Detox Body Wash both contain the exclusive SenSpa signature scent which is "a blend of 9 essential oils that aim to create a spa ambiance reminiscent of the exotic East." These products also contain detoxifying seaweed, dead sea salts and marine extracts which aid in deep cleansing of the body. Scented with sweet orange, lime and rosemary, these products smell incredible and really make taking a shower feel like more of a treat than an obligation. I particularly love the SenSpa Detox Body Scrub, which is unlike any other body scrubs I've used before. It has a thick, creamy consistency and is less oily and greasy than other body scrubs on the market, but it does the job well. I always say that shower products are so important because a shower is often the first thing people do when they wake up or one of the last things they do before they go to bed. The better your shower experience, the more likely you are to have a great day or a good night's sleep. These gorgeous products by SenSpa are truly luxurious and at less than £10, they're a bargain too. 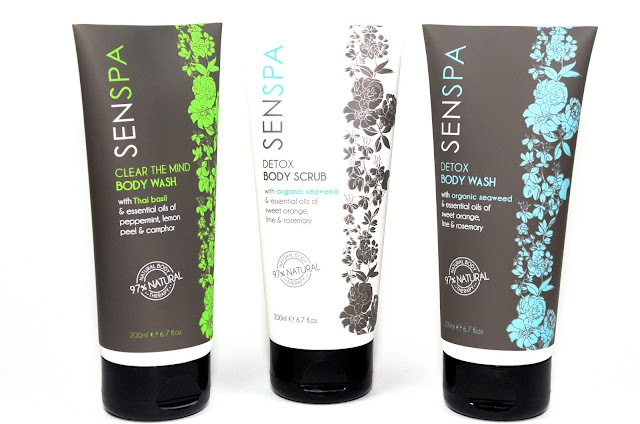 SenSpa Clear the Mind Body Wash, Detox Body Wash and Detox Body Scrub can be found online at SenSpa and Waitrose.